The Australian Government provides funding for a Rheumatic Fever Strategy that includes funding for control programs in Western Australia, Northern Territory, South Australia and Queensland. This strategy also funds RHDAustralia. RHDAustralia is operated by Menzies School of Health Research. 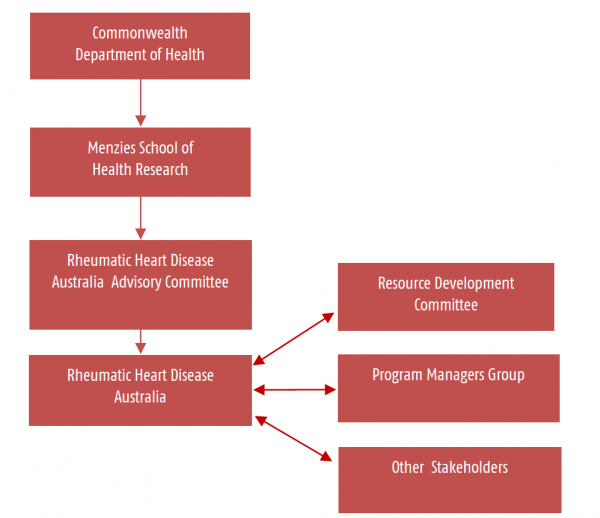 The RHDAustralia governance structure includes the RHDAustralia Advisory Committee (RAC) and a resource development committee. The Advisory Committee provides high level, strategic advice to RHDAustralia. The Committee advises RHDAustralia on interpretation and further analysis of surveillance data derived from the jurisdictions, the development and maintenance of the program, the improvement activities undertaken and contract deliverables as requested. as well as senior representatives from jurisdictions. Each of the jurisdictional RHD Control Programs has its own Advisory Committee. The resource development committee is a sub-committee established to enable discussion around education activities that relate to ARF and RHD in Australia. Membership comprises key stakeholders and the RHD Control Program representatives. The sub-committee assists RHDAustralia in the development and dissemination of RHDAustralia approved evidenced based education tools and resources. How is it diagnosed and managed?